Charlie Flynn cannot wait to make his television debut after the Scottish lightweight made it six wins out of six fights as a professional. Flynn, 22, beat Englishman Lee Connelly in Glasgow on Sunday and hopes to make his TV debut in Manchester on 27 February. Top of the bill will be Northern Ireland's Carl Frampton against England's Scott Quigg. "We are in talks," Flynn told BBC Scotland. "That's a massive show." He added: "Two world title belts in front of a massive crowd in Manchester and I would be on the undercard." Frampton faces Quigg in a world bantamweight unification fight. "That, for me, is an absolutely huge fight," said Flynn about the possibility of being on the same card. Flynn stepped up to the professional game after winning gold at the Commonwealth Games in Glasgow last year. He stressed that, despite beating Connolly, his management will not rush him into a title encounter so soon in his professional career. "You are talking about three years for a British title fight - about 15-18 fights but maybe a Scottish title fight by the end of next year. "I just turned 22 there and, for a pro, that's pretty young, so there's no rush." "I know my management has massive confidence in me, but we're just taking it slow for now." Flynn was delighted with his latest outing, despite being taken the distance by Connolly. "It was a great fight," he said. "I started off good and the fight could have got stopped in the first round. "I was landing some heavy shots and he was on the ropes for about a minute solid. "He was taking a lot of shots and everybody thought the referee was going to step in. "But he let it continue and, after the first couple of rounds, we decided to stick with the boxing and get the rounds in the bank instead of trying to go for the stoppage. "Everything went according to plan and we won every round." Also in Glasgow, featherweight Joe Ham stretched his winning featherweight record to six bouts with a second-round stoppage of Croat Mirsad Ahmeti. The 24-year-old Scot had floored his opponent three times in the first round. 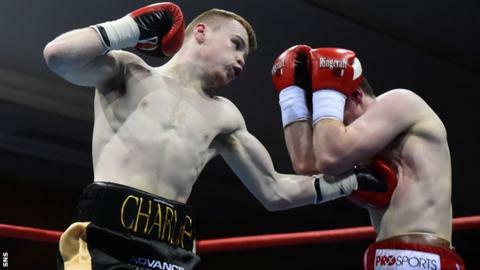 Elsewhere on the undercard, Lewis Paulin registered a win on points over fellow Scottish super-featherweight Jamie McGuire, while welterweight Stewart Burt had to settle for a draw in his bout against England's Fonz Alexander.